Jura Giants – Storms and Steep! 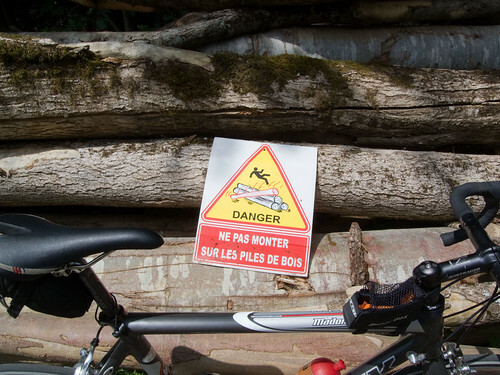 You are at:Home»France»Jura Giants – Storms and Steep! Col du Grand Colombier and Col de la Biche. 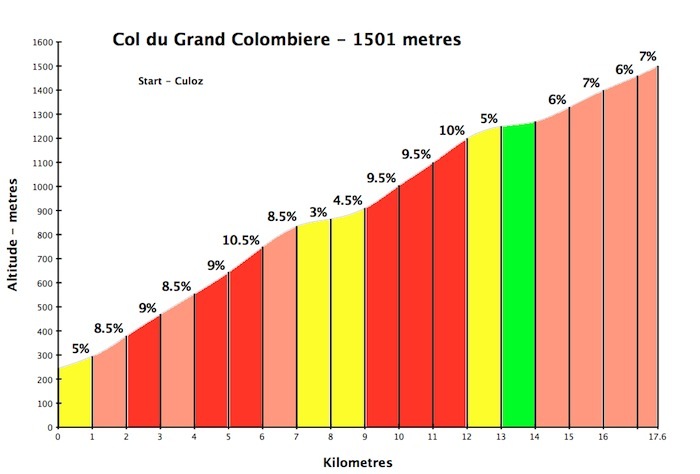 Col du Grand Colombier and Col de la Biche (map at bottom). 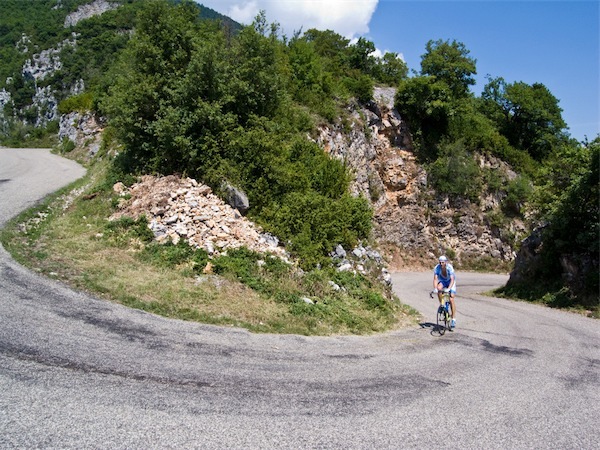 There are 4 ways up the monster Col du Grand Colombier. Today’s route from Culoz is the second hardest, but the most scenic. For details on the +20% madness from Artemare, and details of all four sides see here. From the very start, the open route winds up the mountain with great views of the Rhone river and Lac du Bourget in the distance. Fun. Honestly, looking at the grade chart (which is pretty impressive), it still felt worse …. partly the heat, partly the uneven grade, partly because Eric makes it looks so easy, partly because I am weak!. The route then enters the woods with some easier stretches and a long, very steep 3 km ramp – a full km @ 12%. From June 2006: Probably the most famous climb in the Juras. There are four very steep ways up this monster. To become a Confrérie des Fêlés du Grand Colombier (translated: Brotherhood of Loons (freaks, crackpots) of Grand Colombier) one needs to climb all four in one day. We survived and made it to the top. I tried to weasel out and just descend back – but Eric “motivated” me to continue with the plan and descend down the other side to loop back via Col de la Biche. If only we had looked over our shoulders at the nasty clouds arriving. 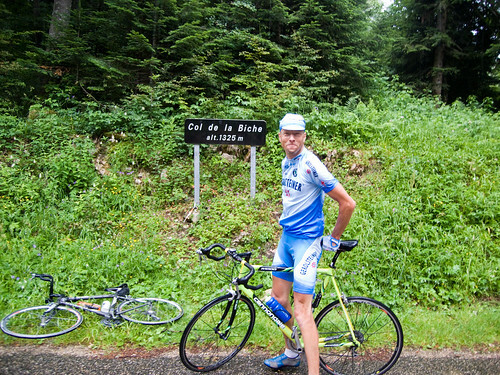 This west side is the “easy” side of Col de la Biche – we would descend the very challenging east side. I took a short short-cut with a crazy 18%-20% stretch to join the main road – wow – Eric heard me screaming in pain. 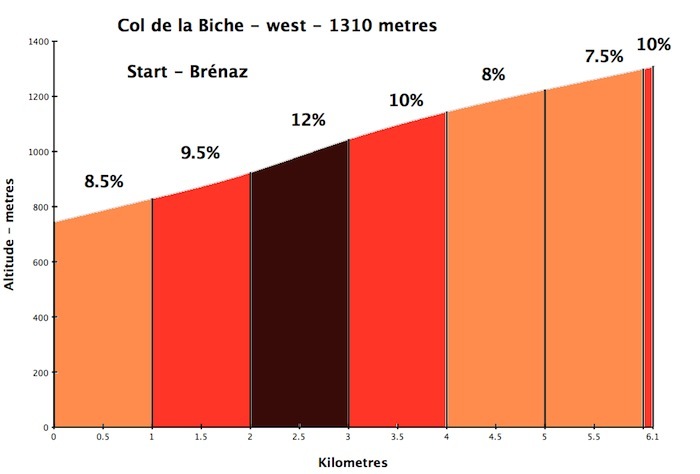 And Biche can start FAR lower than the elevation chart – but today this was enough – and included all the very steep parts. Superman (Eric) who had ridden all the way from Geneva (an extra 90 kms or so to the loop) kept saying how refreshing the torrential rain was – while I whined about the thunder. When we made the Col, Eric somehow thought that pouring rain meant no need to take a Col photo! Huh? Still, he’s a great cycling partner for many reasons, but most of all for never complaining about how slow I descend – and on a bumpy, steep, hair-pinned, wet, long descent, this was especially slow. Amazing how one can feel near death from heatstroke and then shiver with cold – on the same ride. A classic example of a ride that would have been less fun on my own. 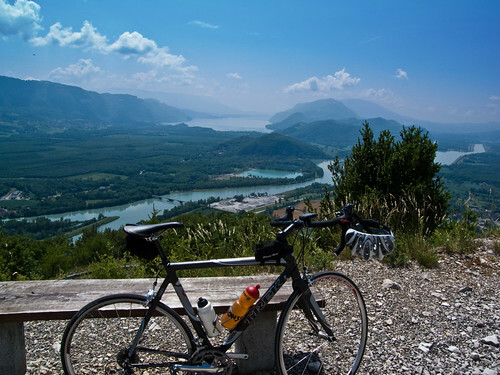 Cyclo tourists will continue to flock to places like Alpe d’Huez, Galibier, and Ventoux – and for good reason. But this area — with Mont du Chat just down the road (Le Cycle magazine called it possibly the toughest climb in France) — is filled with challenging, stunning rides on virtually deserted roads. Will, I must say that even though I (really) felt the steepness too today, I had a great day riding with you. Trust me that you don’t climb, nor descend slow, just less fast. And yes, that rain was very refreshing. 🙂 Thanks for another great ride. you’re home already? Only one 160 km lap? Lazy …. Belle aventure, bravo à vous ! More difficult from Anglefort? Peut-etre. Definitely on paper. But I think the Culoz route has more variation – with several very short, nasty steep stretches.